Every year must come to an end and a new year begins. So every new year as a parent, you’re probably thinking “I should have a new years resolution…”. Well, you don’t have to, but it’s a good time to reflect on your life and think about something you may want to work on. We wanted to compile a list of ideas for parents to start the new year off with a great goal. Kids can have fun thinking of a New Years resolution too and to make it easy for you we have made an easy New Years resolution worksheet for kids. 1. Lose those extra 10 pounds. I think this may be at the top of everyone’s list (including mine). 2. OK, losing 10 pounds may seem like a bit of stretch. How about give up your favourite snack food? That’s right. Say no to those Cool Ranch Doritoes chips (just like my husband did 3 years ago and is still Cool Ranch free to this day). 3. Start to floss your teeth. And really stick with it this time. I mean really. Not just for 2 weeks and then the 2 weeks before your next dentist appointment. 4. Start to exercise or create an exercise schedule. Plan to do it once or twice a week. Make the goal manageable enough so you stick with it. 5. Do something nice for someone once a week. It can be as simple as complimenting someone for a job well done. But make a conscious effort to go out of your way. 6. Stop that bad habit like biting your nails. 7. Try one new recipe once a week. You can start here by checking out the fabulous recipes we have. But steer clear of the sweets if you’re going to take on #1. 8. Take care of yourself more and do something for yourself once a week. Go to the spa, read a book, take a bath, take a nap. The list is limitless folks. The only criteria is no kids. 9. Volunteer. Join your favourite local charity or volunteer for something related to your kids like coaching or helping out at the school. 10. Start a new hobby. I never thought that blogging would turn me into a craft-extraordinary or a baking lover, but it’s really opened me up to trying new things. And the most fun and exciting part? Getting to think of new and creative things to share with you guys. 11. Seek out new friendships. Introduce yourself to someone new and you never know if they’ll end up being a lifetime friend. 12. Travel to at least one new place. Who doesn’t love vacations? If money is tight, find a way to still see a new place. Visit a new camp-ground or city you’ve never been to. Explore your own country or be a little more adventurous and go overseas to a completely new place. 13. Change your hair. Well, it doesn’t necessarily have to be your hair, but could be your wardrobe or your make-up. Do something new to refresh your look. Sometimes a simple cut and colour is all you need for a pick-me-up. 14. Call your Mom, Grandma, Sister, Brother. Be the one to reach out, not the one waiting for the phone calls. 15. Cut down on TV time. Really this should be on everyone’s list. If you’re going to tackle some of the ones listed here, you’ll likely need more TIME. Wouldn’t you rather be spending that time doing #4, #9 or #10? Looking for more New Years Eve Ideas? 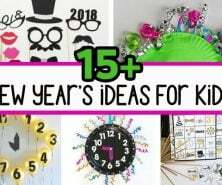 Read our 15 New Years Eve Ideas for Kids article. 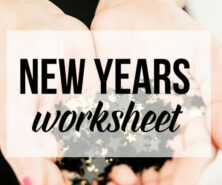 It’s packed with so many fun New Years Eve Ideas! #8 is definitely my favorite – though they are all great! But one of my resolutions this year is to take more time for myself! #8 is my favorite – but you listed so many great ones! But one of my resolutions (that really started in November/December last year) is to take more time for myself! Happy New Year Kim! 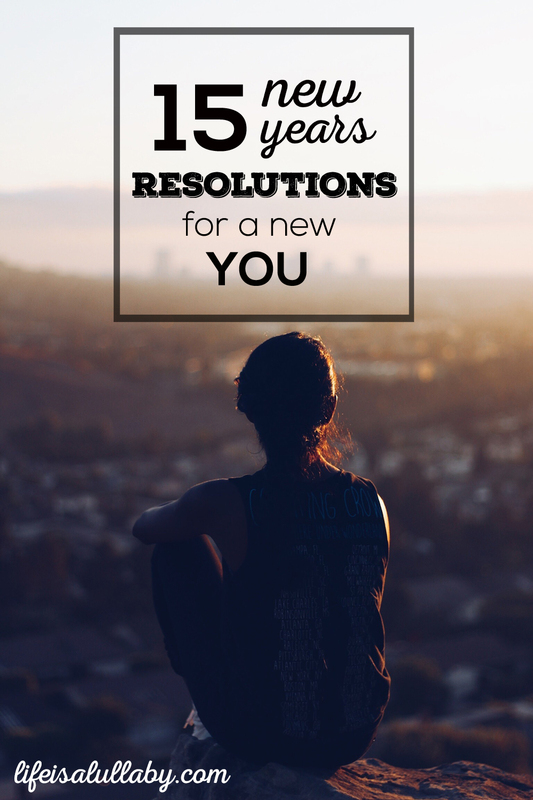 Kim ,I love this post and the great New Years Resolution ideas. I definitely need to do #1 & #2 except my obsession is not cool ranch chips but ruffles and dip, I need to be ruffle free!!! Thank you for sharing! Happy New Years! I’m glad I inspired you to go ruffle free! You can do it! I wasn’t thinking about making a resolution for 2015 because every time I do I feel like I don’t keep up with it. But, I feel like I need to just make smaller goals or just have 1 resolution. Thanks for inspirations on a few resolutions I should consider. Definitely, I need to lose 10 lbs! Making it manageable is definitely the key, Danica! I need to do so many of these! Especially #1 and #2. I like having easier to achieve goals too, like #14 and #15. Thanks for sharing the great ideas! I hope you have a great NYE and even better 2015!! Thanks for stopping by Sydney!